Oh, what to make of this. 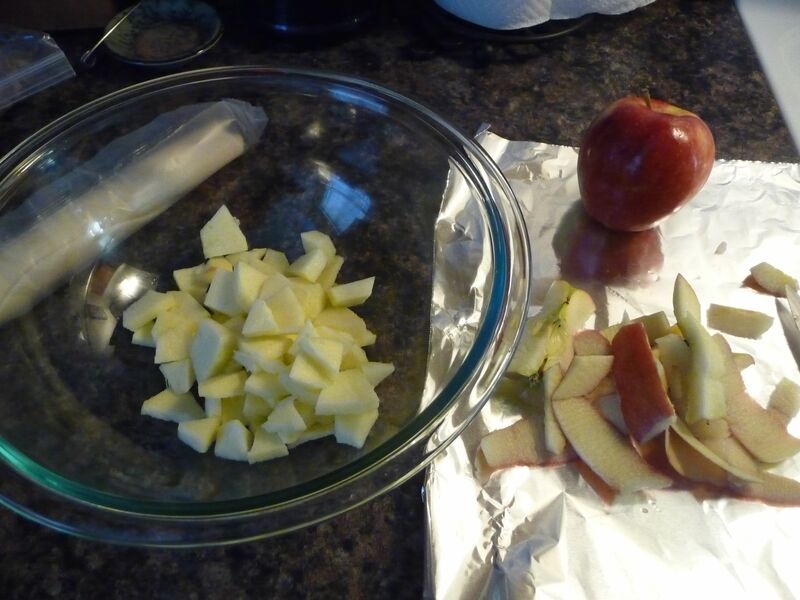 All it takes are some apples, cored and sliced. A pinch of salt, some flour, sugar and some butter. And, time to bake. Simple. One of the first desserts I made when I was a kid. One my Mom encouraged me to try making. Now, it is one of my husband, Jeff’s favorite – especially if there is vanilla ice cream in the freezer or he can make a quick trip to the grocery store to get some. Me… I like the simplicity. The smell of cinnamon as it bakes. The steam coming up from a serving spooned into a bowl and the melting of that delicious vanilla ice cream as it hugs the apples while it melts. And, Oh, the taste…. as my Mom would say, “Tastes like more.” Jeff agrees. 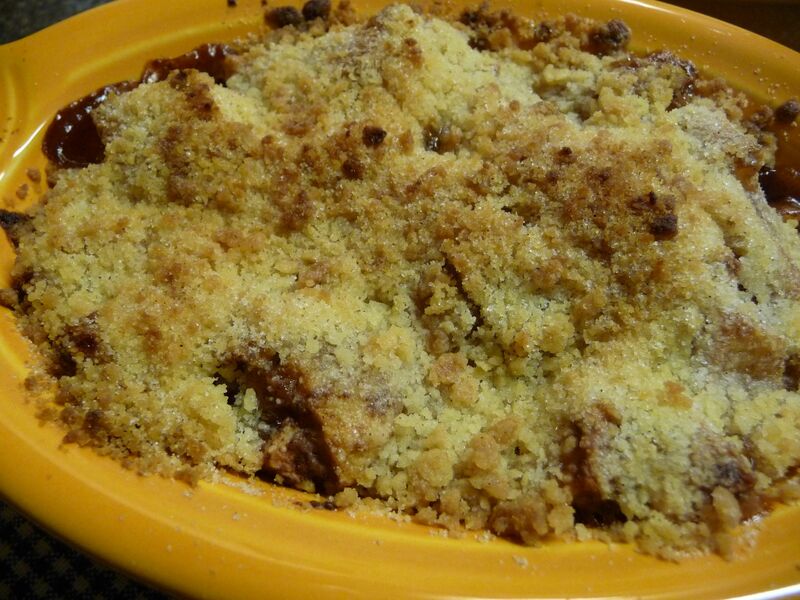 Apple Crisp, fresh out of the oven. My husband considers himself lucky…. some may consider him tortured. To be subjected to my cooking experiments…. poor man. I ‘dreamed up’ another recipe that I thought I’d try. 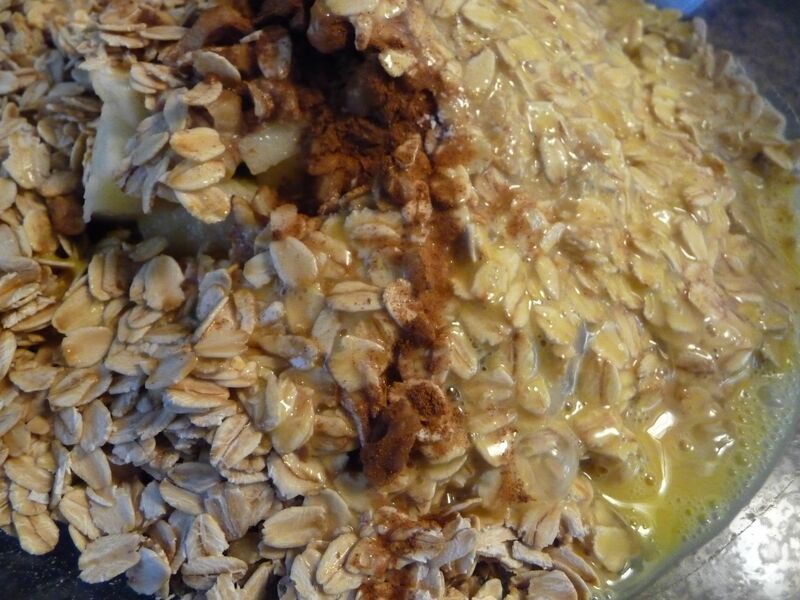 I bet there are recipes like this somewhere out there on the internet, in some great cook’s blog; after all… that is how I learned of Baked Oatmeal. Here I had thought I had ‘dreamed it up’ and yet I found it later that morning in a blog. 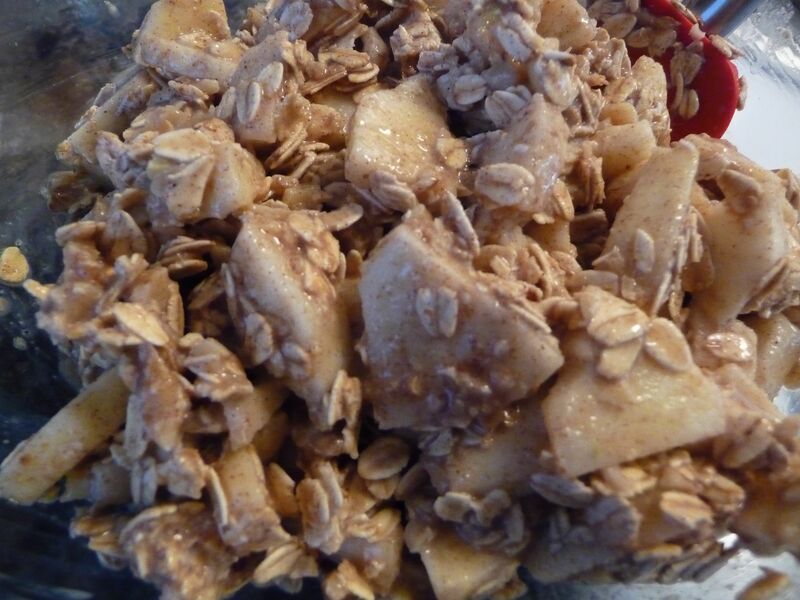 This recipe is a cross between baked oatmeal and apple pie… sans sugar. I don’t have a name for it just yet, may never. But here goes. 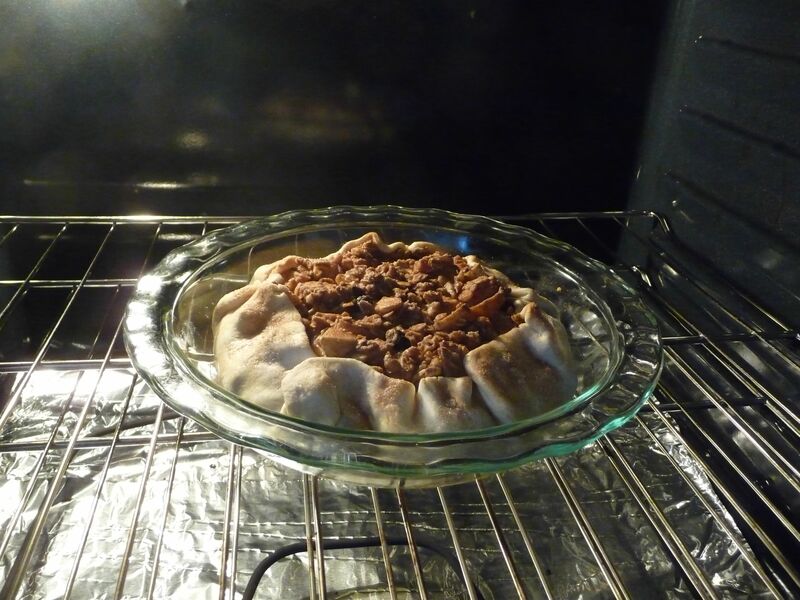 Place purchased pie shell on counter to warm up, to become flexible. 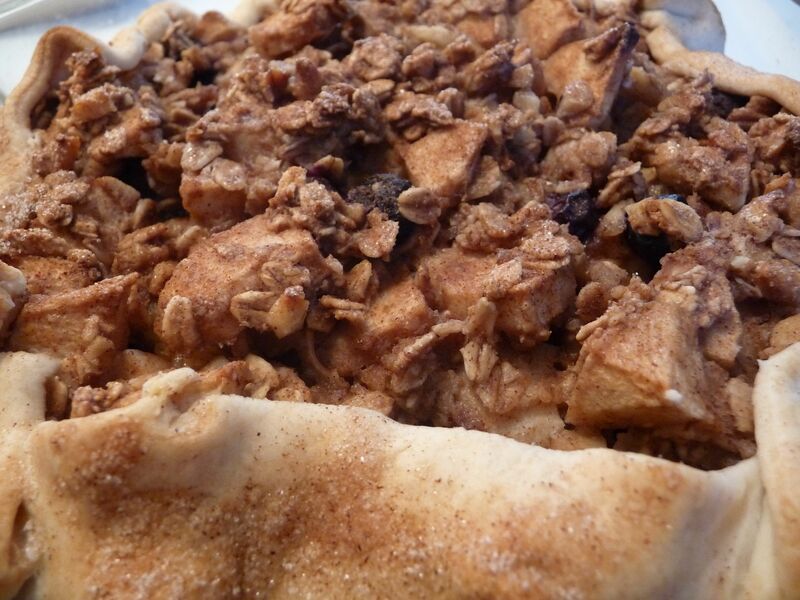 OR… make your own pie shell from your favorite recipe. 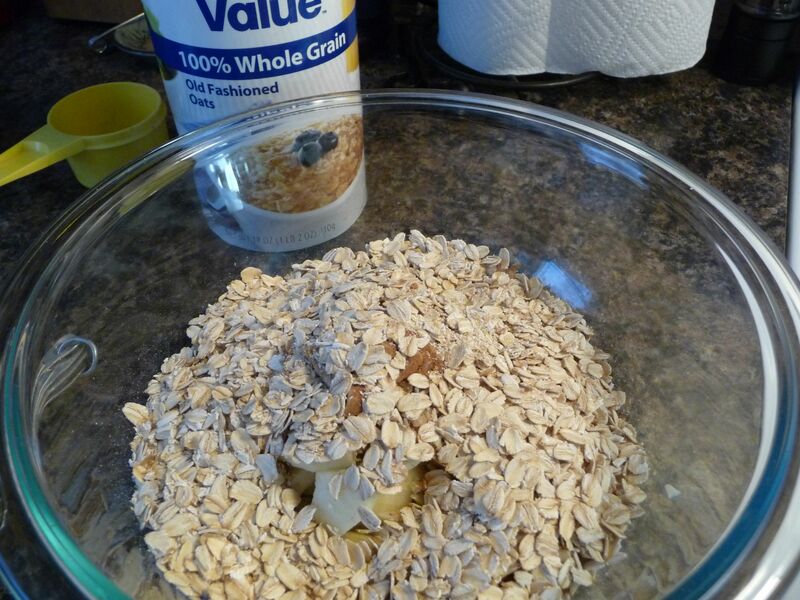 Place all ingredients as they come in a medium-sized mixing bowl – keep in mind, I made this up as I went. Dot with another 1/2 tablespoon of butter. 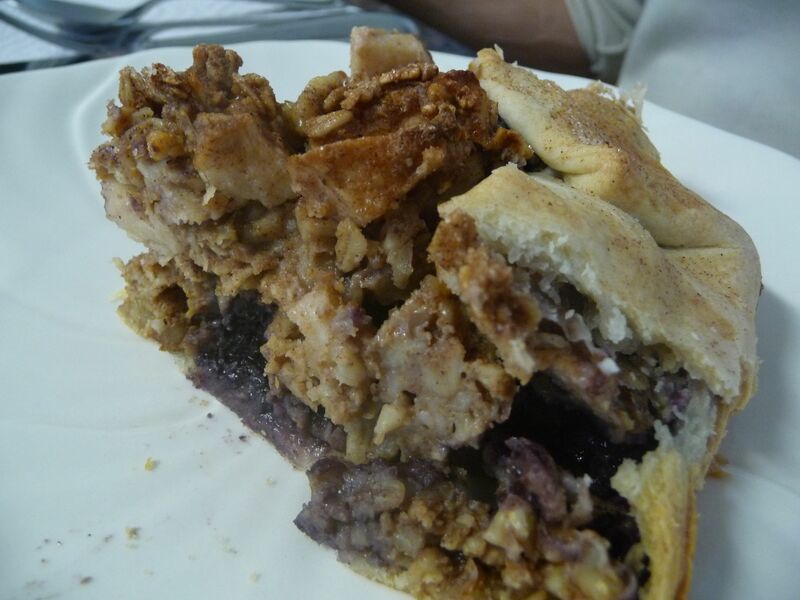 Fold up and in the sides of the pie shell for that rustic look. 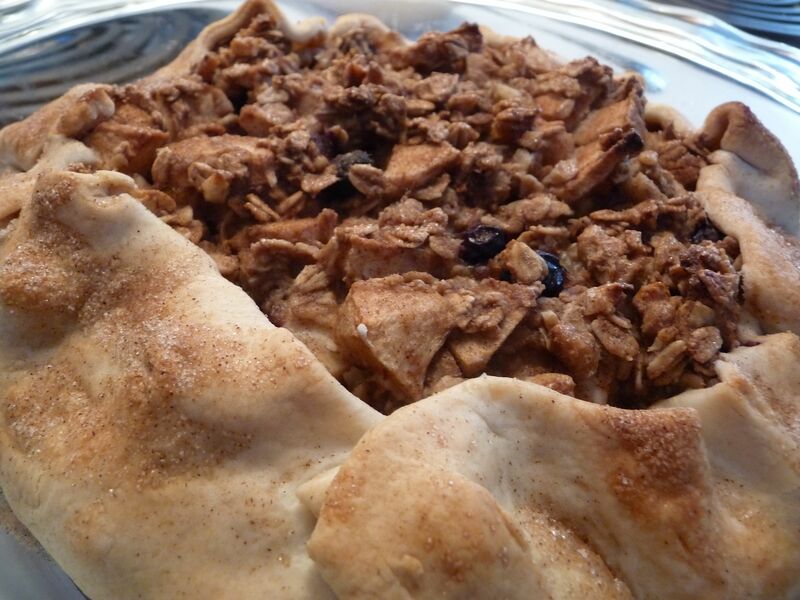 Brush folds with milk and sprinkle on a mixture of cinnamon and sugar, amount to your liking. 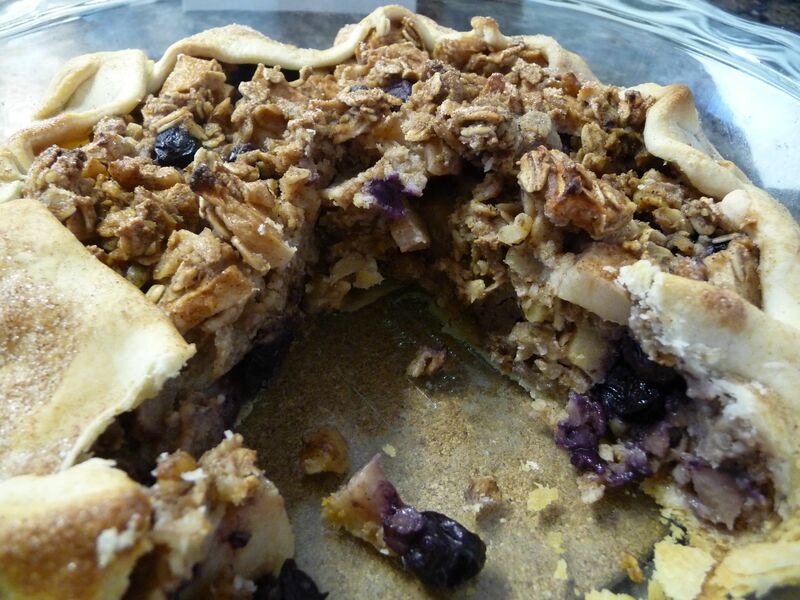 Keep in mind there is NO sugar in this recipe, merely the natural sugars of the apple and blueberries and the sweet spices. Granted I have been trying to cut down on sugar, but truth be told, I actually FORGOT to add any. We’ll see how it turns out. Bake. 40 minutes in a 400 degree oven. This was an experiment and I may need to adjust it for another Sunday breakfast… but for now, We Eat! I tried to create something healthy. 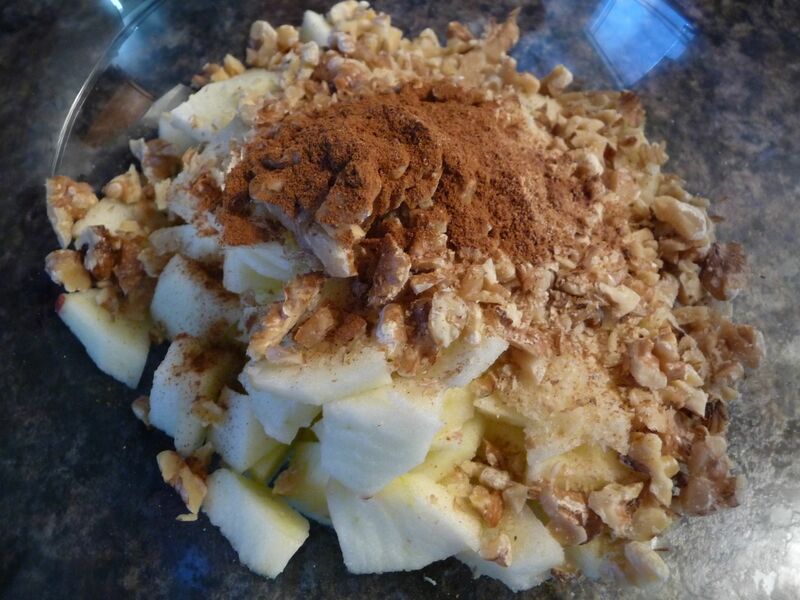 It is somewhat healthy without the added sugar, the fiber of the apples and blueberries, the nuts and the oats – the omega3s of the walnuts and the benefits of the cinnamon, nutmeg and ginger are added bonuses. 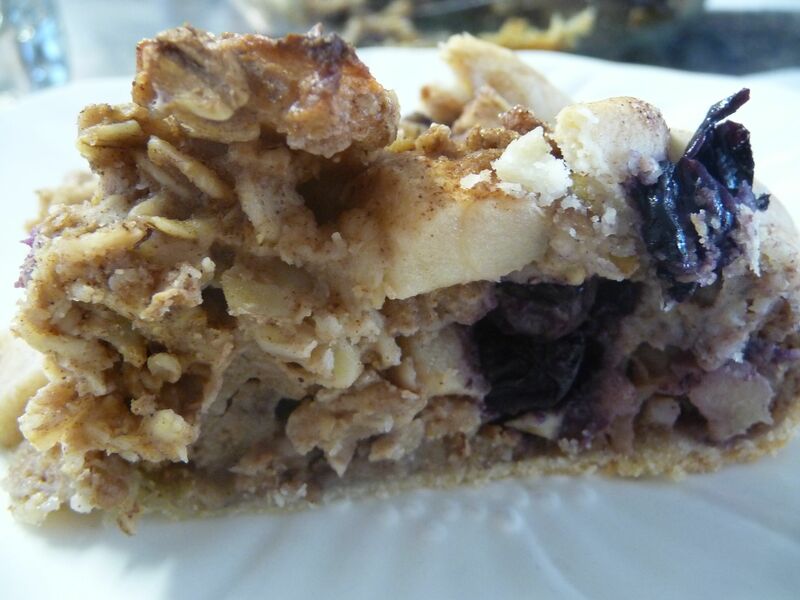 Next time, I may simply add more blueberries as they added the sweetness we wanted. I had also previously thought about cubing up some cheese to bake in it…. maybe we can add some cheese to it as we warm it up… but next time for sure (unless I forget). Fruitcake, how could I forget? Yes, how could I forget fruitcake? Believe me, I’ve tried!!!! I don’t like fruitcake. Yet, I’ve made it once. Only once. That was only because Mom was battling leukemia and could not make it herself. She had made it for years, her mom’s recipe. Mom made fruitcake for Dad and my brothers, then later, my young niece. How this beautiful little tomboy could like fruitcake, I will never know. Maybe it was time spent with her “Grammy” to make the fruitcake. Amazingly, all these family members actually LIKE fruitcake! Amazing. How could they? Yes, even though I don’t like fruitcake, at all, I made it. Just that one time! 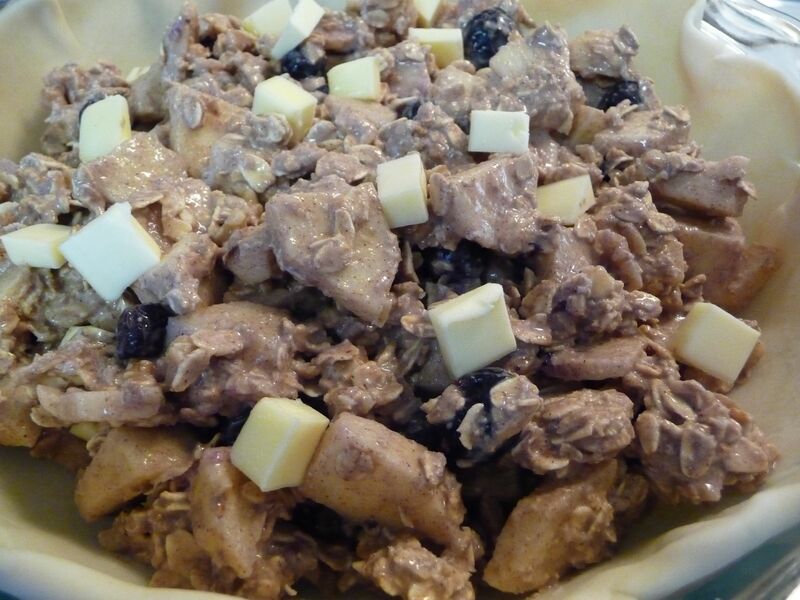 I made the fruitcake that year with my young niece…. out of love. Love for my Mom. Love for my niece. Love for my Dad and brothers. But, I mostly made it for Mom…. she would have made it herself if she were able. She was simply too weak at the time and, with her illness, should not be working in the kitchen regardless. 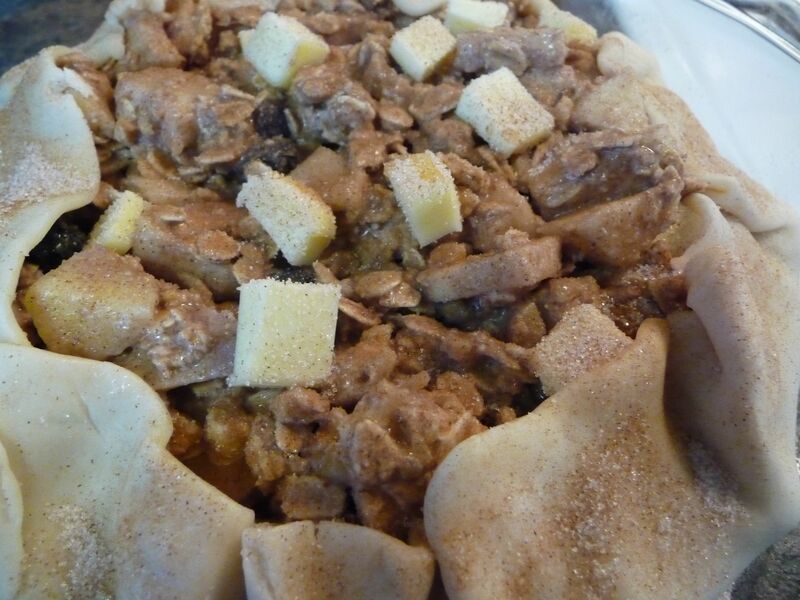 Mom’s fruitcake, using Grandma Booth’s recipe, uses a LOT of ingredients. And, it takes a LOT of time. Well, a LOT of time for a first-time fruitcake maker and her young seasoned apprentice. Even though Mom was sitting at the dining room table watching the ordeal and giving us instructions and encouragement, Natalie and I struggled to make the fruitcake (a double batch, all at once). It seemed like it took us forever. Thankfully, Mom was a patient teacher and we all laughed. I will never forget that time making Mom’s fruitcake with my niece for our family. And, while I still don’t like fruitcake, at all, I LOVE that fruitcake-making memory. I remember Mom LOVED Christmas time. Her family would gather. She could once again treat them to traditional holiday enjoyment. Besides the Christmas decorations, a holiday dinner on Christmas Eve, a family drive to look at Christmas lights before returning home to exchange gifts, Mom would make sure her family had some traditional Christmas treats. Among the treats, Cookies. Christmas Cookies!!! Mom taught me how to make sugar cookies. Christmas Trees like Mom used to make. While using my laptop, looking for the Swedish Jelly Cookie recipe, I also spied what just may become a tradition of mine to add to the mix. Cocoa Coffee Crinkles. Okay, they had me at “Cocoa”, so I thought they’d be worth a try and I was oh-so-right. YUM….Decadence! Dark chocolate, coffee and cinnamon in an easy to make cookie. This recipe called for some instant coffee, not having any I used some fresh finely ground coffee instead. Perfect. I added a bit more Vanilla Extract (1/2 tsp) and a teaspoon of Almond Extract. Also, I did not level the teaspoons of Baking Powder, but they weren’t super heaping either. … so actually just a bit more Baking Powder. And I added Green Food Coloring until the dough was the green I thought it should be. Be sure to refrigerate the dough. When you roll out the dough to cut the shapes, be sure to work with a small amount of dough, placing the rest of the dough back in the refrigerator. Roll out and Repeat. Bake for 6 minutes at the temperature given, Cool, Frost and EAT. On a warm morning in July, the call came. My cousin, Delbert, had called to let us know his mom had passed away. Like with other families and extended families dealing with the uncertainty of Alzheimer’s disease, we knew this day would come. 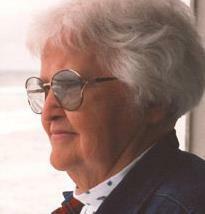 Aunt Shirley had battled dementia and Alzheimer’s. Now, her battle over, she was free. Free of the ravages of Alzheimer’s; how it stole her memory and how it stole Shirley away from her family. A celebration honoring Shirley’s life was to be held on a Saturday in August. Followed by a luncheon. While making plans to attend the memorial service I thought of the many times our families had been together. Great family times, with a great family. Warm, friendly, FUN, humorous and supportive. Love encircled each of us. The vast amount of love came from Aunt Shirley and Mom. Sure our respective dads loved us…. but love was in everything these women did…. the hugs, smiles, cooking, laughs and discipline. All of it let us kids know we were deeply loved and oh-so-cared for. Whenever we had the chance to get together with their family there was great anticipation of seeing our “cousins” again. “Cousins” because actually our dads were the cousins. Considering that we were second and third cousins, however this technically works out, we were family. We had no other relatives in our area so when this family moved within 50 miles of us we were elated. We had COUSINS nearby. I made a “Cheap Cake” using the same recipe that Mom had gotten from Aunt Shirley. I had never had that wonderfully dark chocolate cake before knowing Aunt Shirley. Now, I can never see a recipe for it, mix one up and bake it, or eat a decadent slice of it without thinking of her. She and Mom put together some fabulous meals for our families. And trust me, each of us loved to eat. A total of six growing boys and me, along with our dads and themselves to feed, those two women were busy. Thankfully, they were great cooks too. Just as they were great cooks, they were even better Moms. Moms who loved their children with all their heart and soul. Each of them happy, strong, intelligent women. They wanted good things for their children and expected good from them in return. We knew we were loved. Each time I make or eat a slice of “Cheap Cake” I will always remember Aunt Shirley. Her love for her family and her love of life. Thank you and rest well, Aunt Shirley. 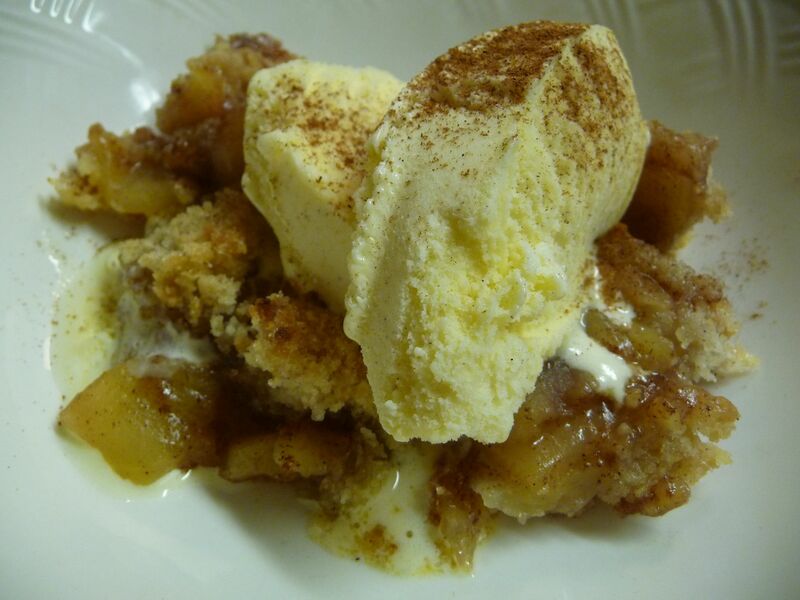 Much like her mom, Mom could watch someone create an epicurean delight and then recreate it …. nearly the same, if not better. I know, I watched her do it many times. A few weeks ago, I once again followed in Mom’s footsteps. I had seen an apple tart being created on the Food Network. How easy the presenter made it look. I knew I could make it, so I quickly wrote down the ingredients and made a note of the baking temperature and time. Basic pancakes that we ALL enjoyed. Sometimes she’d add a side of bacon and eggs to these good pancakes. Sometimes just pancakes with butter and syrup or sugar. A childhood memory of mine is when she’d add things into the pancake batter as they were on the griddle. Bacon, ham, berries – you get the idea. Good pancakes. Mom also made GREAT pancakes. YEAST pancakes or SOURDOUGH pancakes. As you might envision… these were the next best thing to HOT FRESH HOMEMADE BREAD…. ultra yummy. Again, sometimes with just butter and syrup or sugar (and cinnamon). Other times, a side of bacon and eggs. GREAT pancakes. While I do like pancakes, I don’t care for boring, average or less than average pancakes. Mom spoiled me that way. For that I am thankful. When I make pancakes they are NEVER ordinary. I always put extras in the batter, add to the recipe in some form….. or, I don’t make pancakes at all. I always add something…. 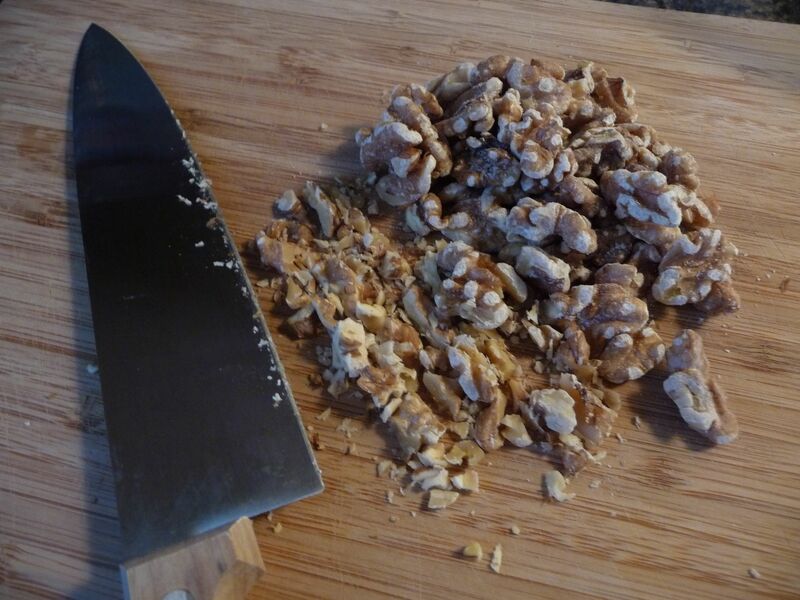 chopped nuts, oatmeal, berries… something. And I do not use white flour as the only flour ingredient. Many of times I don’t use white flour at all. 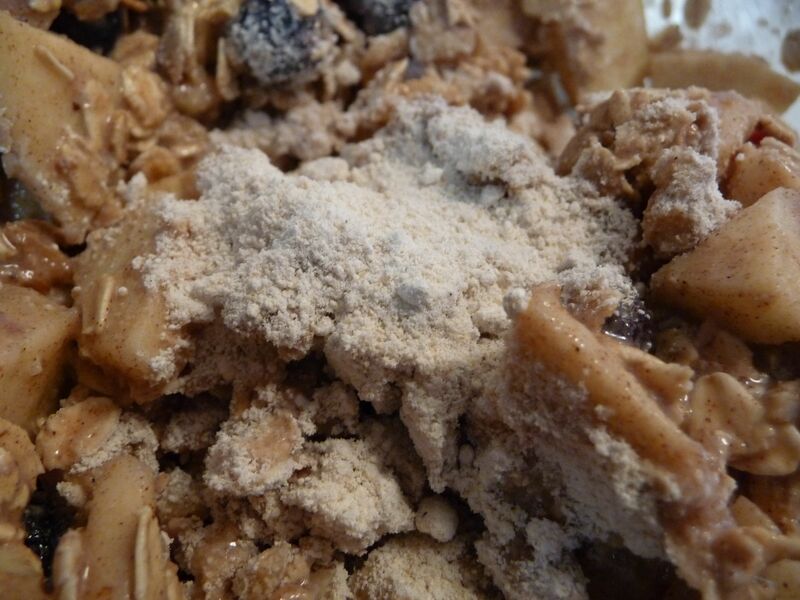 I usually use a combination of oat flour and whole wheat along with the other additives. Last Friday I had planned to make banana pancakes for Sunday breakfast. Thanks to a couple of spotted bananas that I won’t eat unless they would be cooked in something (and not too often then). Yet, my husband had other ideas for those bananas. He ate one with his breakfast on Saturday and one for a snack later in the evening. OOPS… there went my new experimental pancake idea. Yes, I would have simply made up the concoction based on an average pancake recipe. Earlier last week I had spied some recipes putting lemon and blueberries together. That sounded like a GREAT idea. Yet, a couple of weeks ago I had made blueberry pancakes. Besides I had my taste buds set on Marrionberries. I had thought of the lemon flavor…. then it hit me. Recently I had made some Lemon Pepper Cookies. So off I went. Basic pancake recipe – omit white flour, substitute half oat flour and half whole wheat flour and add a tablespoon of yellow cornmeal. Add 1-2 teaspoons of Lemon Extract and some Fresh Cracked Black Pepper. Griddle ’em up. Assemble. Enjoy!!! Welcome to Club 82, Mom. Eleven. The calendar remains the same. A healthy, yet cheesy idea. What Me, a Trouble Maker?? ?